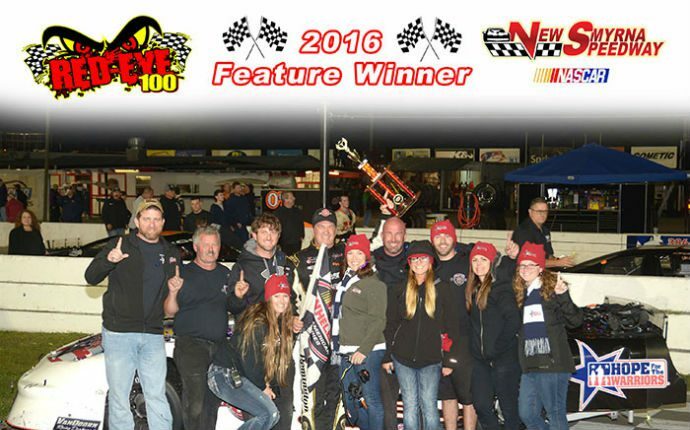 NEW SMYRNA BEACH, Fla. (January 4, 2016) – Mike Skinner drove to a dominating win in the No. 5 American Auto / Hope For The Warriors / Management Resource Systems pro late model at New Smyrna Speedway on Saturday night. Claiming the checkered flag in the Zack Donatti Memorial 100, the retired NASCAR Camping World Truck Series champion returned to late model competition for the first time in approximately a decade at the half-mile oval in New Smyrna Beach, Fla. The race marked the first event of the 2016 Drive For Hope program organized by Hope For The Warriors, a national nonprofit focused on restoring self, family and hope for post-9/11 service members, veterans and military families. In a dominating performance, Skinner led all but three laps en route to collecting the checkered flag in Saturday’s 100-lap race. After setting the fast lap in qualifying, Skinner rolled off in the fourth position following an inversion that set the final race lineup. The Volusia County resident quickly claimed the lead, taking over the top spot by the fourth lap of the race. A series of mid-to-late race restarts led to several challenges for the front spot; however, the NASCAR veteran ultimately held the lead on each restart to finish the evening in Victory Lane. To learn more about Hope For The Warriors, visit HopeForTheWarriors.org.